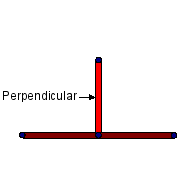 Perpendicular refers to the line which extends from a line and forms a right angle to the line. Two lines that are perpendicular to each other are said to be orthogonal. This page was last modified 04:23, 21 February 2010.